It was a sunny Friday afternoon in Camden Town, and the pavement was covered with teenage girls passing round flasks of tea and choc-chip muffins and fawning over one another’s corsetry and bloomers. The reason behind this epidemic of beautifully turned out teenage rebels? The impending arrival of a startlingly unique young woman with an honesty as refreshing as her unmistakable voice. Emilie Autumn’s sound is a surprisingly catchy mix of baroque classical music and electronic industrial rock, but her almost cultish appeal seems to lay beyond even her musical talent: in a world where airbrushed celebrity role models are two-a-penny, this bipolar burlesque performer with an electric violin and an impressive death growl is teaching girls to find beauty in a broken world. The first and most striking thing one must come to terms with at an Emilie Autumn concert is that it is not really a rock gig at all. To put things in perspective, Emilie’s bizarre onstage universe is being translated into a West End production for 2014, and with its tongue-in-cheek cabaret styling and lashings of audience interaction, it’s not difficult to picture the show as a sort of twisted feminist pantomime. Joining Autumn onstage were four cabaret performers known as the “Bloody Crumpets”, and between the five of them they treated the audience to swordplay, burlesque dancing, stand-up-comedy and an unforgettable segment in which the girls mutilated cupcakes and hurled them into the audience. While the unconventional delivery and fan in-jokes initially left me a little stunned, it wasn’t long before I found myself screaming and gesticulating along with the best of them. After the show was concluded with dramatic aplomb, Autumn returned to the stage alone with two familiar tracks from her earlier reportoire – Mad Girl and Thank God I’m Pretty. In contrast to the theatrics of the main set, watching Autumn sat alone at the keyboard singing in her girlish style, her voice breaking with inelegant emotion, seemed strangely voyeuristic. It felt that we were being treated to a moment alone with the petite, outspoken, self-deprecating woman behind the fantastic costumes and elaborate story lines, and her joy at the flawless singing-along from the audience was genuinely touching. By the time the Bloody Crumpets returned to the stage with their delicate harmonies, I must admit there was a lump forming in my throat. 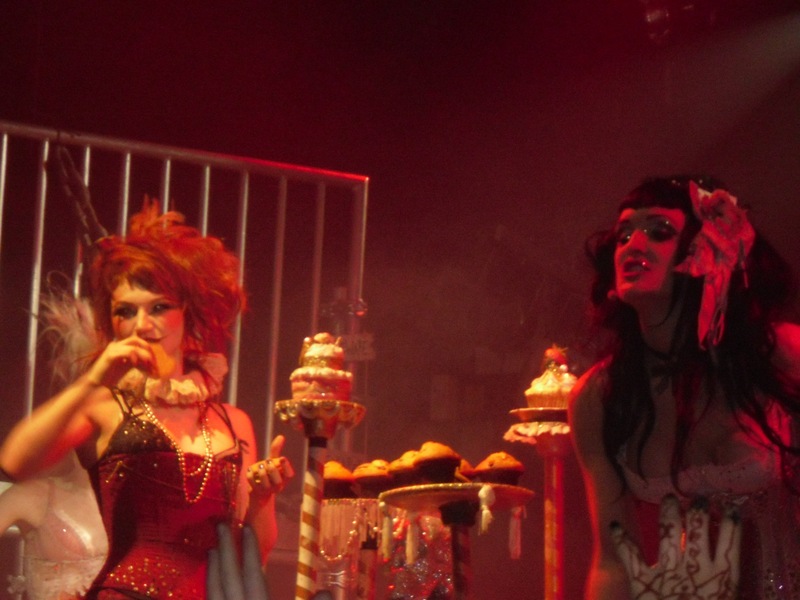 The Emilie Autumn experience is not for everybody – those worried about the hygiene of scantily clad young ladies spitting cake into the audience, for example, may find themselves experiencing some discomfort. Emilie’s voice is not pretty, her messages are not comforting, she pulls no punches and draws on truly gruesome imagery to make her point. However, those willing to suspend their disbelief and allow themselves to be carried away by the dark yet lovely world of the Asylum for Wayward Victorian Girls will emerge feeling enlightened. For an LA native Emilie Autumn seems to have a distinctly English appeal: combining macabre insanity and a nice cup of tea to somehow create a sense of true unity amongst her followers.